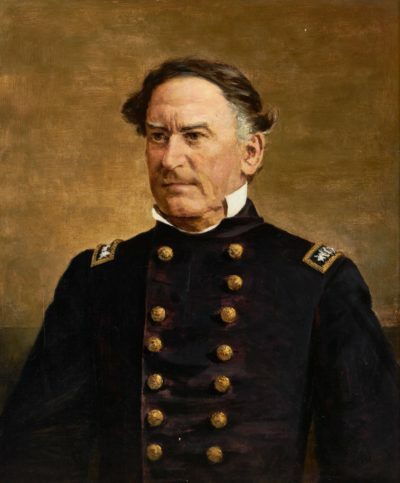 David Farragut fought in the War of 1812 under his foster brother, Captain David Dixon Porter. Farragut was the first to hold the rank of Rear Admiral, Vice Admiral, and Admiral in the US Navy. He is remembered for his legendary order at the Battle of Mobile Bay (1864), popularly paraphrased as: “Damn the torpedoes, full speed ahead.” He remained on active duty for life, an honor shared with only six other U.S. Naval Officers. Admiral Farragut has guarded The Army and Navy Club since its founding in 1885 as the United Service Club. Farragut Square in Washington, DC was named for him when the statue, which faces our Club’s entrance, was dedicated in 1881. The statue was cast from the propeller of Farragut’s Civil War flagship, USS Hartford. Two separate classes of destroyers were named for him, in 1934 and 1958.